A few years ago, I acquired a cache of old letters written to Schulte's Book Store in New York City during the 1940s to 1960s. 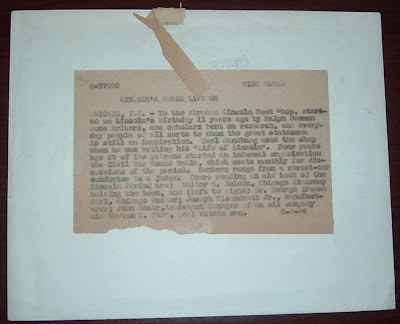 Most of the letters were from authors, artists, and collectors of varying degrees of note, such as authors Rose Wilder Lane and Stefan Lorant, and woodcut illustrator J.J. Lankes. These are just three I've written about from the two-dozen-plus letters in the collection. 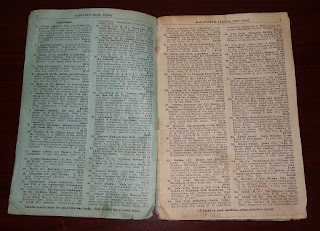 I've been hoping to add a store catalogue to the collection to gain more insight into Schulte's stock and anything else about the business it might offer. Now I have one--Catalogue 81. There is no date, but an online search of the phone number (Stuyvesant 2550) turns up a few Schulte references dating from 1918 to 1924. 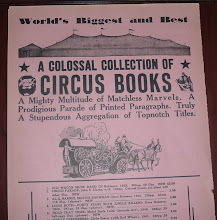 So this catalogue is probably circa 1920s, a few decades before the correspondence mentioned above. 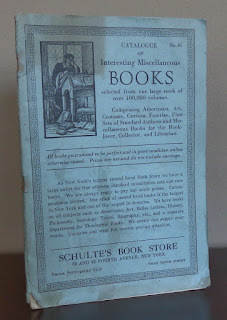 But it does reveal on the cover some information that clearly shows Schulte's was a well-established book store long before the correspondence in my collection took place. 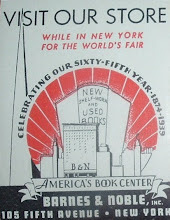 The front cover boasts that Schulte's is the largest second-hand book store in New York and one of the largest in all of America with an inventory of more than 100,000 books. 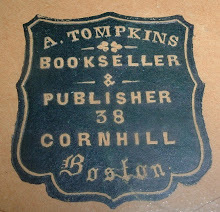 Their stock consisted of Americana, Art, Costumes, Curiosa, Facetiae, Fine Sets of Standard Authors, and miscellaneous books for the book-lover, collector, and librarian. 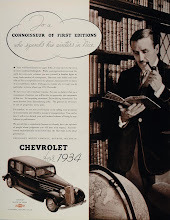 Additionally, the cover ad goes on to state, "we have a large outlet for fine editions, standard subscription sets and rare books." It then reiterates the size of the inventory and expands a bit on the subject matter one is likely to find there: Americana, Art, Belles Lettres, History, Philosophy Sociology, Travel, Biography, and a separate department for Theology. Something for everyone. Inquiries and correspondence about selling books to Schulte's are encouraged. 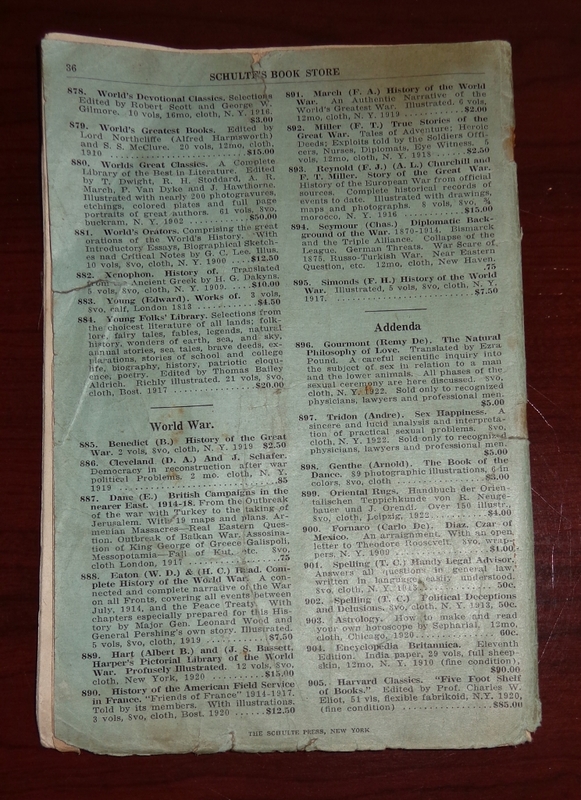 With so much to offer, the catalogue jumps right into it with double-column listings that start immediately at the top of the inside cover page and run without a break to the bottom of the rear cover. No images, no ads--a no-frills, workman-like catalogue. 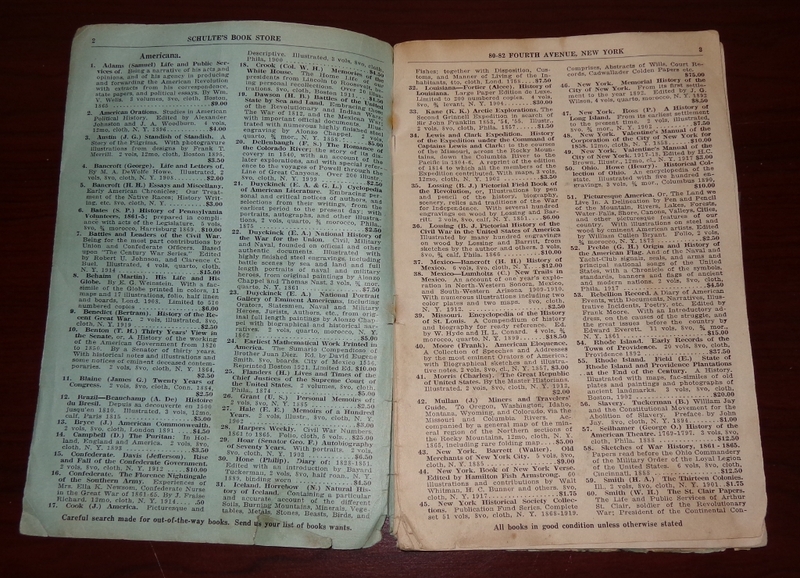 Nine-hundred and five entries comprise the 36-page catalogue, which was apparently well-read, used, and abused. 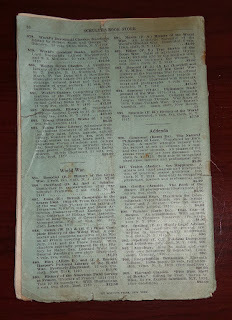 This beat-up, stained, worn copy is exactly how a catalogue should look (particularly of this vintage). Had it been in fine condition, it's purpose for existing would likely have gone unfulfilled. 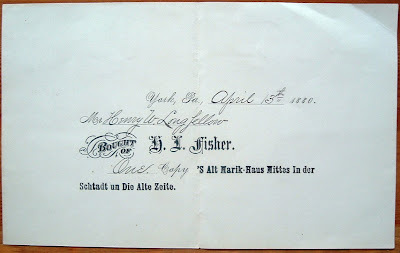 Today is appropriate for revisiting a 2009 post I wrote about Henry Wadsworth Longfellow and a book purchase he made in 1880. Today is Longfellow's birthday. One of America's most famous poets, Longfellow was born in 1807, 216 years ago. Below is my blog post from November 27, 2009, Longfellow's Receipt. 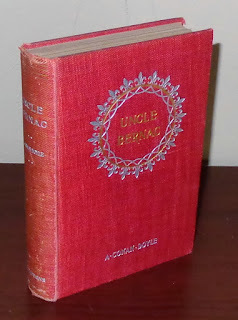 Scouting books in a second-hand shop a few months ago, I pulled from a shelf this copy of Uncle Bernac, by A. Conan Doyle, better known as Arthur Conan Doyle and as the author of the Sherlock Holmes books. As I customarily do with older books, I checked the endpapers for a bookseller's label, or ticket, and a bookplate. 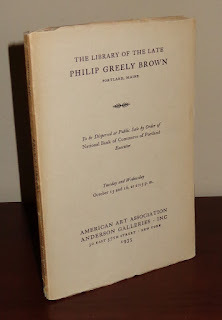 Uncle Bernac had no labels from previous book shops where the book had resided during its life, but I found something more interesting--a book plate that introduced me to a fairly well-known book collector from the late nineteenth and early twentieth century--Philip Greely Brown. The provenance of the book begins with Brown. 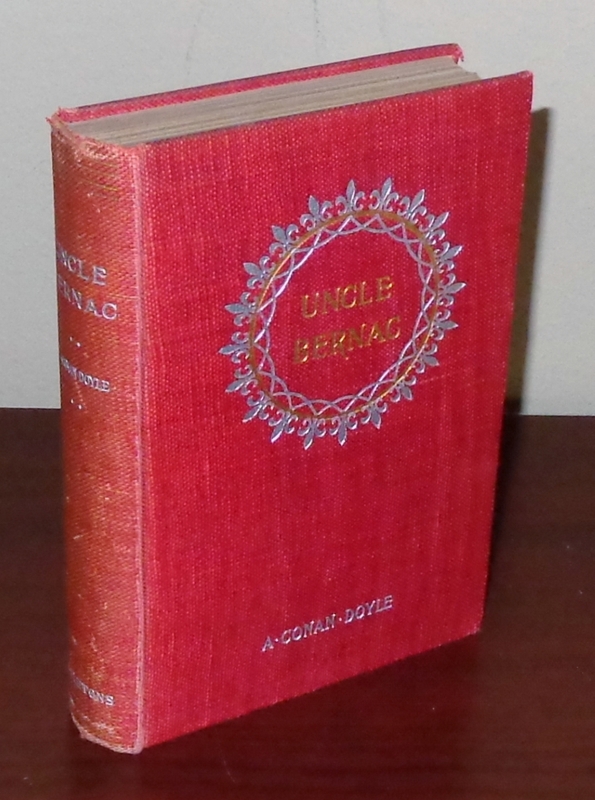 Above his bookplate in the upper-left corner are his initials and the date June 97, which is the publication date for this copy of Uncle Bernac. That makes sense--a bibliophile would want to purchase first editions. 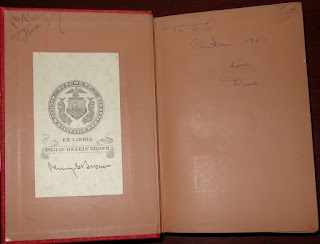 Then in 1951, somebody named Dave bought the book and presented it to his father for a Christmas present. Fast forward to 2013, more than a hundred years since Greely installed his ownership marks, I have the book. Looks like Dave's dad and whomever else might have owned it took pretty good care of it. The Library of the Late Philip Greely Brown, Portland, Maine, to be Dispersed at Public Sale by Order of National Bank of Commerce of Portland, Executor, Tuesday and Wednesday October 15 and 16, at 2:15 p.m.
Philip Greely Brown was born about 1855. An entry in the In Memoriam section of the The Diamond of Psi Upsilon, Volume 21, Issue 2, 1935 states that he died December 18, 1934 in Portland, Maine in the house he was born in. Further, he was graduated from Bowdoin in 1877, which helps estimate his birth year, assuming he was about 22 years of age when he left Bowdoin. Years later, he would establish and provide the funding for a composition prize at his alma mater in memory of his father--The Philip Henry Brown Prize at Bowdoin College in Portland, which is still awarding two annual prizes to members of the senior class for excellence in extemporaneous English composition. A successful businessman and leader in the community, Brown became President of the First National Bank of Portland and of the Board of Directors of the Portland Public Library. He also inherited and managed real estate holdings from his grandfather's estate. All this would indicate a man with the means to collect fine books, though that escapes mention in the fraternity journal. The auction catalog for Brown's library offers no biographical information, unless you consider a man's library a portal into his character or personality. 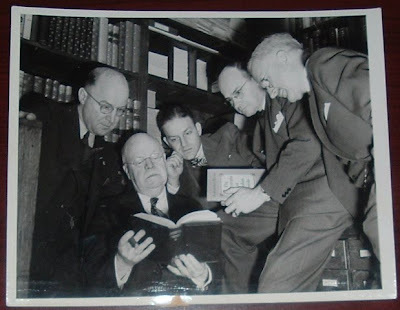 Scanning the titles, his collection was heavy in history, Americana, and literature. No estimated values or starting bids are given. Today, February 12th, is Abraham Lincoln's birthday. 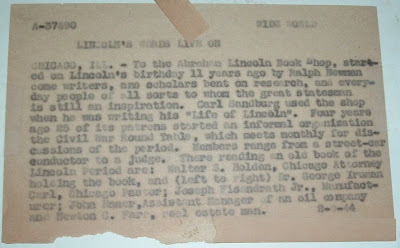 Here's a 1944 press photo from the Abraham Lincoln Book Shop in Chicago, Illinois, which I wrote about on this blog three years ago today. Enough time has gone by now and this seemed a good time to repost it, given all the attention Lincoln has gotten recently in books and film.